Getting ready for the upcoming V-Cinema team-up movie of the year? Then feast your ones on the official movie poster for Girls in trouble Episode Zero featuring the Twin Cam Angels and the female Space Sheriffs and Hellvira! The movie will feature a team-up between the SPD girls Jasmine (Ayumi Kinoshita) and Umeko (Mika Kikuchi) with the female space sheriff's Shelly (Suzuka Morita), Shishi (Misaki Momose) and Tammy (Mayu Kawamoto). 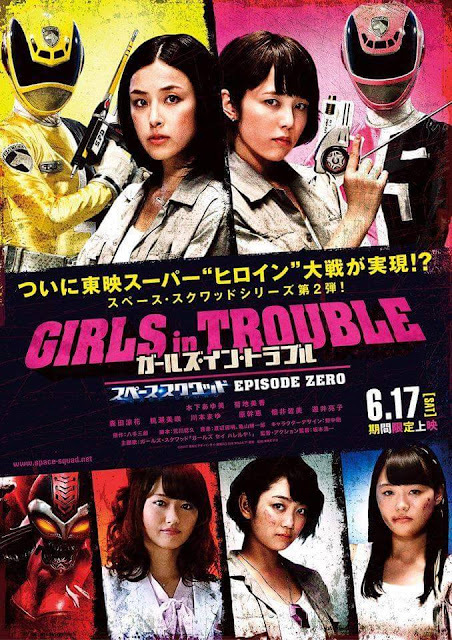 Written Naruhisa Arakawa and directed by Koichi Sakamoto, Girls in trouble Episode Zero will premiere in Japanese cinemas this June 17, 2017.